Garfield of Thomson Scientific first introduced this idea in the 1950s. published by that particular publisher. decribed on the altmetrics tab and provide an alternate way to evaluate scholarly impact. narrower subject specific database such as EconLit. Alternatively search across a number of different databases for full-text articles using the Google Scholar search option. technical journals worldwide in the sciences and social sciences. journals from over 3,000 publishers in 60 nations. 1999-present. and expert evluations and citation metrics. Free registration required. and books by searching in general citations field. information contained in the Scopus® database (published by Elsevier). the articles as well as the citations underlying the metrics. authors are citing to your publications. Graph your citations over time. verify that your publications listings are accurate and comprehensive. the journal literature of the sciences, social sciences and arts. Generate citation reports by author. Create citation maps for articles. more traditional forms of tracking article impact. 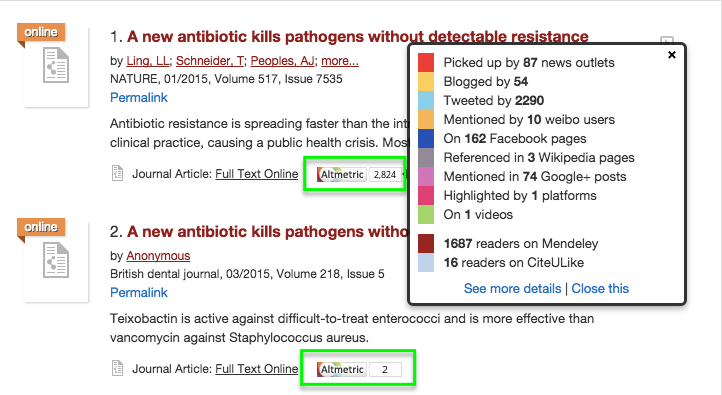 ImpactStory aggregates altmetrics measures from articles, datasets, blog posts, and more. install the extension in your browser (Chrome or Firefox). Explore the different options suggested in the library guide. Please feel free to contact your librarian if you need any assistance. Creating an online presence allows you as researcher and your research to become e-visible instead of invisible! humanities and all the types of publication that are missed. How to Find Citation Impact? To tell your impact story, you need to find the citation count of your research papers through citation databases and alternative metrics tools. an individual published paper or of a researcher's body of work. To show the impact an article has by showing the number of times it has been cited since it was published. To compile the references that the author of the publication used. To identify and read the most influential publications in a particular field. To find related work and to track the development of a certain publication. would be wise to use multiple databases to fully utilize this feature. measure it, your knowledge is meager and unsatisfactory." Pendlebury, D. A. (n.d.). Using Bibliometrics in Evaluating Research (White Paper). Research Department, Thomson Reuters, Philadelphia, PA USA. Consider whether available data can address the question. Choose publication types, field definitions, and years of data. Decide on whole or fractional counting. Judge whether data require editing to remove “artifacts”. Use relative measures, not just absolute counts. Recognize the skewed nature of citation data. Confirm that the data collected are relevant to the question. Ask whether the results are reasonable. the individual year for which a metric is provided. published in the two previous years. Also see: "Understanding Impact Factors"
the five previous years. Also see: "Four Ways of Measuring Impact"
mentions, news media, social bookmarking, article views, and downloads. Also see: "Using Altmetrics and Social Media for Research and Networking"
Eigenfactor than those from poorly ranked journals. Also see: "The Eigenfactor and Other Metrics – Plus Ça Change"
see: "Demystifying Google Scholar Search and Results"
source may determine a different value of the h-index for each author. Also see: "Four Reasons Why the h-index is Here to Stay"
given year by the number of articles published in that year. Also see: "How to Navigate the World of Citation Metrics"
from a low-ranked journal. Also see: "Metrics Alternatives to Altmetrics?" average citations in Year X to papers published in the previous 3 years. different disciplines. Also see: "Can We Do Better Than Existing Author Citation Metrics?" consider where to publish their new research. To browse publications in a broad area of research, select one of the areas in the left column. For example: SOCIAL SCIENCE. Home Page lists the top 100 h5-index ranked publications in English. 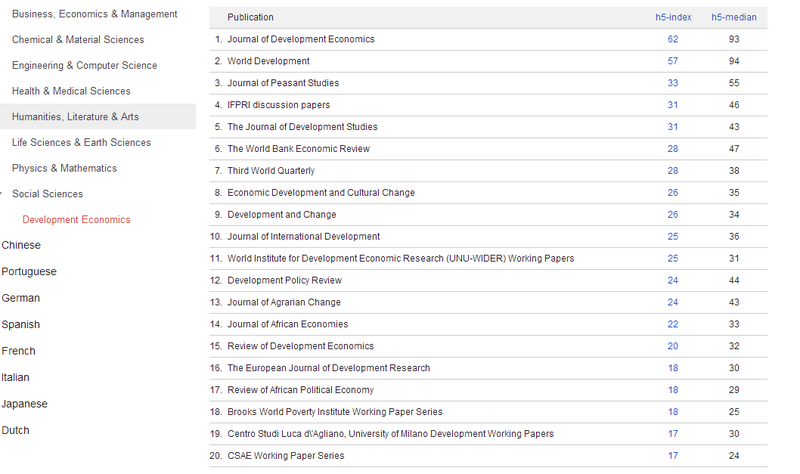 More importantly, it lists the top ranked publications by subject area. published in 2007-2011 have at least h citations." authors as they consider where to publish their new research..."
ISI's Journal Citation Reports and Washington & Lee's Law Journals: Submissions and Ranking can show you the most frequently cited and highest impact journals in law, criminology and penology. The repository is a service of the eScholarship initiative of the California Digital Library. Search results include "Cited By" and "Web Search" references. Search" for locating documents that include the search term or citation. Citations (nee, 1873). Westlaw's citator tool is known as Key Cite. of a number of so-called Fee Based Partner Publications. Be sure to use your full name and standard institutional name/address to assure easily identifiable citations to your work. Pay special attention to writing a descriptive title and an informative abstract. 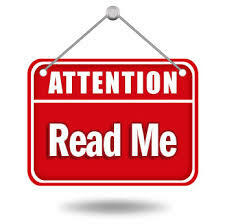 for publications in ResearchID are automatically updated from WOS. are recorded. There is no citation report feature. Google Scholar My Citations – Only tracks your own publications. The University of Wisconsin Milwaukee Libraries maintain a detailed citation analysis guide worth consulting. contact Mark Ludwig, Scholarly Communications Officer, A. Ben Wagner, Sciences Librarian, or your departmental library liaison to discuss your specific needs. 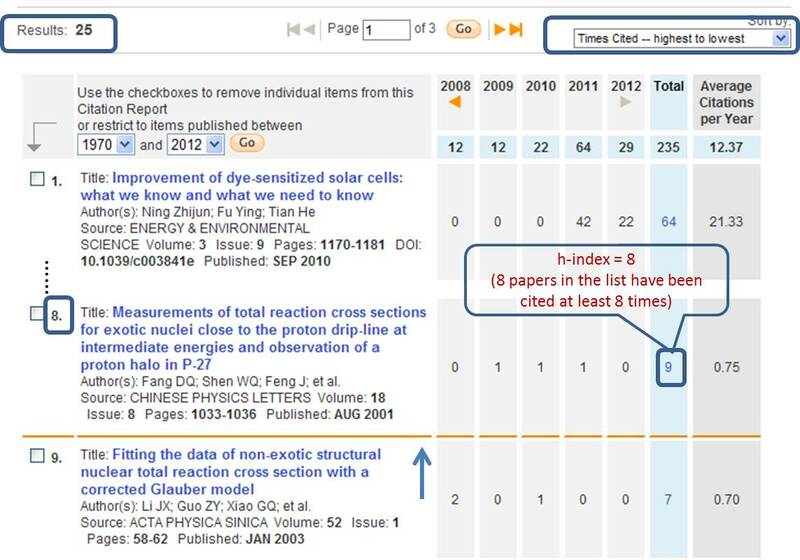 The h-index was developed in 2005 by Jorge E. Hirsch to quantify the research achievement of physicists based on the amount of their publications and the number of citations these publications have attracted. A researcher with an index of h has published h papers, each of which has been cited by other papers at least h times. For example, if the h-index of an author is 8, this means that 8 of this author's papers have been cited 8 times or more. Which databases provide h-index score? cited. 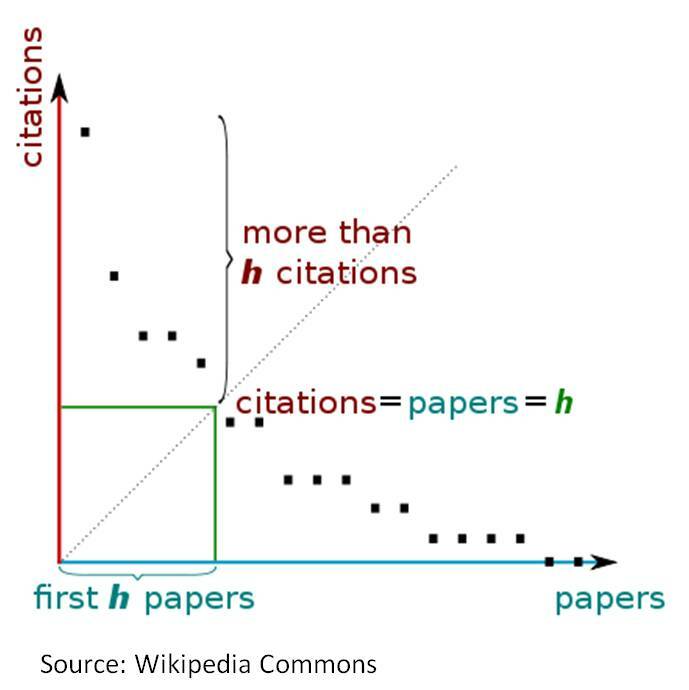 The value of h is equal to the number of papers (N) in the list that have N or more citations. If you have publications indexed in "Web of Science" and "Scopus", remember to verify your author profiles in these two databases to ensure accurate measurement of your publication activities. These two databases allow you to distinguish between your publications and those written by others with similar names. 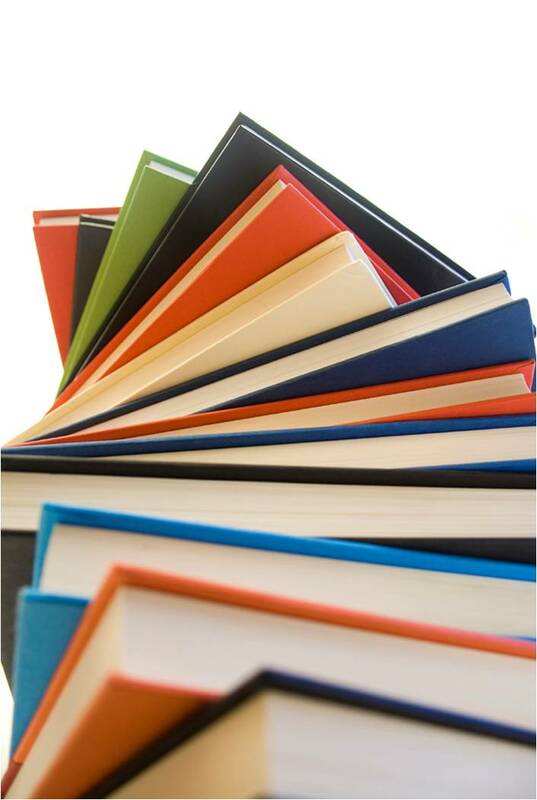 Make sure your author profiles contains all your publications indexed in the databases. If not, add them to your profile. If you have just joined CityU, remember to add “City University of Hong Kong” as an assembling affiliation in your author profiles (e.g. in databases such as Web of Science - registration is required). For the Scopus database, the affiliation displayed in the author profile is based on your most recent publication. file, CV, grant proposals or reports. Refer to "How to make use of altmetrics tools" on the "Altmetrics" page of this guide. investigate mentions as need be. Free bookmarklet that displays cites, saves, links, and social media mentions for individual articles. data sets, slide decks, websites, and other nontraditional publications. PLoS provides their own article level metrics for all publications. A downloadable software program that uses Google Scholar data to create a impact profile for individual authors. USC Sidebar and Results Pages if there is data available. information about where it was mentioned. Google Scholar is increasingly becoming a subject that an academic librarian cannot afford to be ignorant about. Various surveys have shown usage of Google Scholar is rising among researchers, particularly beginning and intermediate level researchers. Our own internal statistics such as link resolver statistics and views of Libguides on Google Scholar, tell a similar story. there is intense interest in details about Google Scholar. More recently there was also the release of a Google Scholar Digest that is well worth reading. 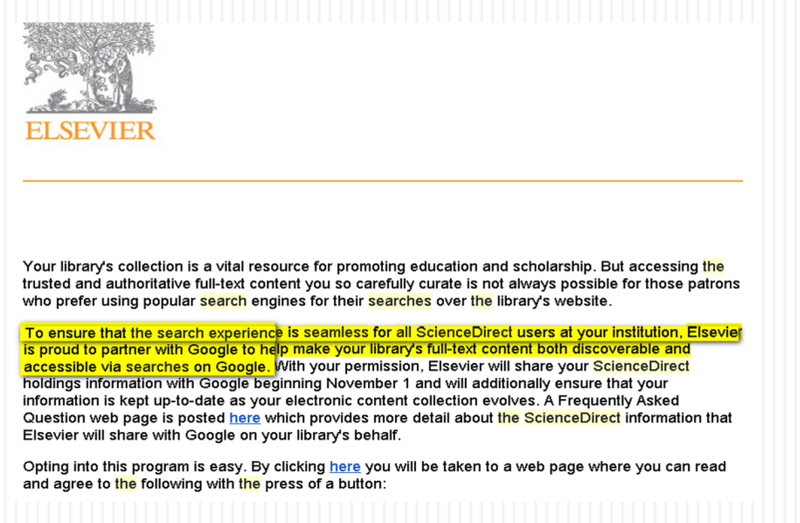 Sadly Google Scholar is something I've argued that libraries don't have any competitive advantage in, because we are not paying customers, so Google does not owe us any answers, so learning about it is mostly trial and error. a) Work on discovery services - lead me to study the differences and similarities of Google Scholar and Summon (also on systematic reviews). Also helping test and setting up the link resolver for Google Scholar. Institutional repositories were indexed and displayed in Google Scholar. surprising or interesting as well. on the publisher site in both Google and Google Scholar. title, only Google Scholar includes full-text in the index. bots can only get at whatever is public, basically title and abstracts. actually different, but the final result is the same). announced with Google in Nov 2013. The FAQ states this explicitly. it on here, so this is just speculation. 2. Google Scholar has a very comprehensive index , great recall but poor precision for systematic reviews. services meant I do have a small amount of interest in how discovery systems are similar and different to Google. In particular "Google Scholar as replacement for systematic literature searches: good relative recall and precision are not enough" was a very enlightening paper that drilled deep into the capabilities of Google Scholar. the papers in the first place when actually doing a systematic review. futile effort if the number of results shown are above 1,000. Why lack of precision searching? See next point. 3. Google Scholar has 256 character limit, lacking truncation and nesting of search subexpressions for more than 1 level. Again Google Scholar as replacement for systematic literature searches: good relative recall and precision are not enough gets credit from me for the most detailed listing of strengths and weaknesses of Google Scholar. Google and Google Scholar does "implied AND" and of course you could always add "OR", As far as I can tell the undocumented Around function doesn't work for Google Scholar though. review queries might of course. that nested boolean operators beyond one level will fail. 4. Google Scholar harvests at the article level, hence it is difficult for them to give coverage lists. content it considers Scholarly at the article level. All these versions are auto-combined. way to succinctly summarise their coverage at the journal title. repositories that may have some of the articles from the journal. Google Scholar indexes at a even lower level at the article level. Of course in theory Google Scholar could list the publisher domains that were indexed? searching all of them anyway. Because of #4 , we knew it was unlikely everything in our institutional repository would be in Google Scholar. I planned to do say Site:http://dash.harvard.edu in Google Scholar and look at the number of results. That should work by returning all results from the site right? Does Harvard's institutional repository only have 4,000+ results in Google Scholar? issue is to randomly sample entries from your institutional repository. Why? Invisible institutional repositories: Addressing the low indexing ratios of IRs in Google Scholar has the answer. under the "All X versions". Perhaps one of the reasons I was mislead was I was reading studies like this calculating and comparing Google Scholar indexing ratios. These studies are useful as a benchmark when studied across institutional repositories of course. isn't indexed or recognised as the main entry), the higher your Google Scholar indexing ratio will be. If the item lacks an abstract Google Scholar can identify, it will tend to have a [Citation] tag. 6. Google Scholar does not support OAI-PMH, and use Dublin Core tags (e.g., DC.title) as a last resort. updates of papers that are already included usually take 6-9 months. to update a site, we need to recrawl it"
Files cannot be more than 5 MB, so books, dissertations should be uploaded to Google Books. Google Scholar have a reputation for having poor customer service. is different and you can get responses. In particular, there is a person at Google Darcy Dapra - Partner Manager, Google Scholar at Google, who is tasked to do outreach for library institutional repositories and publishers. She has given talks to librarians managing institutional repositories as well as publishers in relation to indexing issues in Google Scholar. 8. Google Scholar Metrics - you can find H-index scores for items not ranked in the top 100 or 20. First time I looked at it, I saw you could only pull out the top 100 ranked publications by languages (excluding English). For English, at the main category and subcategories it will show the top 20 entries. find a metric for the publication. Apparently, not as you can search by journal titles. Maybe obvious but I totally missed this. any category or sub-category yet there is a H5 index for this. 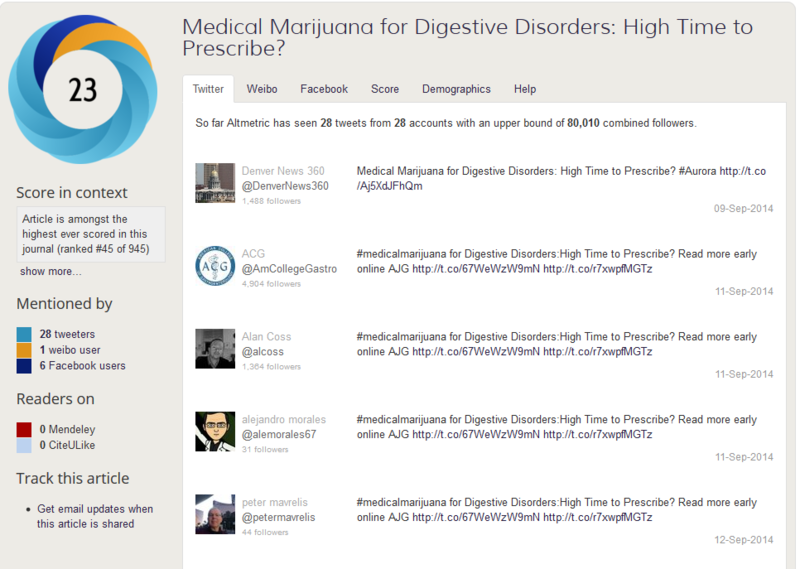 When you exhaust all the usual suspects (JCR, SNIP, Scimago rank etc), you might want to give this a try. Do let me know any errors you spot or if you have additional points that might be enlightening.